We’re so excited to be giving you, your very own Long Term Food Storage Calculator. 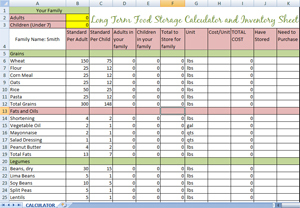 By simply inputting the number of adults (including children over 7) and children under 7 into the spreadsheet, you will automatically have a printout that tells you the quantities of Long Term Food Storage you will need to store. From there you can also put in prices and use it as an inventory tracker of what you have versus and what you still need … all in one place! This is a very simple yet handy food storage calculator to help you easily determine how much food you need to store, and keep track of how your Long Term Food Storage is coming along. Download it today and enjoy! Remember to read our post from last week on Long Term Food Storage Lies Debunked to help you avoid getting overwhelmed as you start on your Long Term Food Storage! Please note for the Cost/Unit column (column H) you need to put the cost/unit, meaning cost per pound, or cost per qt whatever that may be – in that cell. Everyone will have different prices so that is a user entered cell. If you want to do the math right in excel, the special formula is =cost/unit. So if you paid $11 for 50 lbs of wheat, you put =11/50. If you don’t have excel you can print out our pdf worksheet (instructions included) and fill it out by hand.